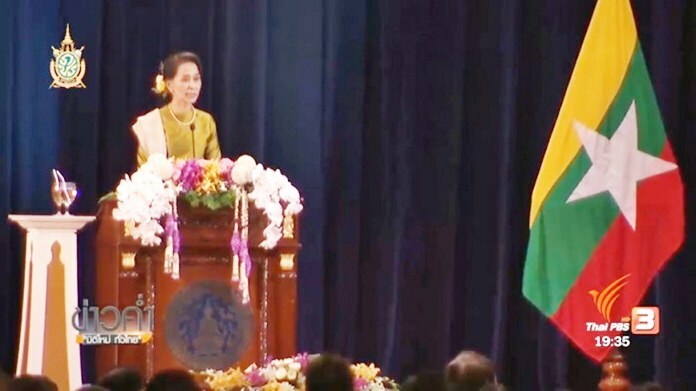 Thailand and Myanmar have enjoyed unique relationship and are neighbours which cannot go anywhere but have to co-exist in peace, unity and with friendship, Aung San Suu Kyi told a large group of Thai university students on Friday. The state counselor and foreign minister of Myanmar said she was very glad to visit Thailand because there are many Myanmar people here and that she was given very warm welcome. She said that one important qualification of human beings is “karuna” (kindness) – a term used by both Thais and Myanmar people which carries the same meaning. “We must have faith that human beings are equal, have hope as well as fear. But with karuna, she said the world will have peace and for development to proceed, there must be peace first. Suu Kyi admitted that there had been conflicts in Myanmar for a long time “but we are now working together to turn conflicts into peace”. She also noted that youths have an important role in the promotion of peace and making the world a better place. The foreign minister was due to meet with Prime Minister Prayut Chan-ocha Friday evening on several issues of common interest such as labour development, trade and joint investment. Three memorandums of understanding were due to be signed between the two countries on labour cooperation, labour employment and border crossings. During a luncheon held by the Thai Foreign Ministry for Ms Suu Kyi, Foreign Minister Don Paramatvinai surprised the visitor by presenting her with a belated 71st birthday chocolate black forest cake.